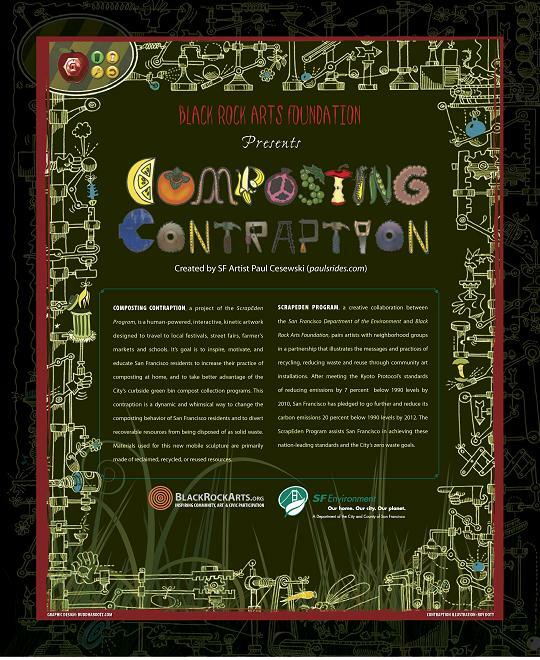 Come to the Maker Faire and see a preview of the next ScrapEden project, which the Black Rock Arts Foundation in partnership with San Francisco Department of the Environment is developing The Composting Contraption. This human-powered, interactive, kinetic artwork is designed to travel to local festivals, street fairs, farmers markets and schools to inspire, motivate and educate San Francisco residents to increase their practice of composting. Read more about the Composting Contraption here. We are proud to be working with San Francisco artist Paul Cesewski, creator of a myriad of contraptions, including the bike-powered rides of Cyclecide’s Bicycle Rodeo and the Star Wheel, a participant powered rolling Ferris wheel. Mr. Cesewski also contributed to the creation of the floating sculpture rafts of Miss Rockaway Armada. Come see this work in progress and contribute your ideas to its development! Maker Faire is a two-day, family-friendly event that celebrates the Do-It-Yourself (DIY) mindset. This community of Makers who share their projects and skills comprise a growing DIY movement of people who look at things a little differently and who just might spark the next generation of scientists, engineers and makers.